i know i’ve been linkbombing these past couple of days but after reading your blog, i’m starting to see everyday “food” as a challenge to my attempt to get healthy. why does this person say that bacon is better than turkey bacon? Pork bacon’s got a bad rap for wreaking havoc on your cholesterol. But is turkey bacon really any better? The Truth: Stick with the pig. As far as calories go, the difference between “healthy” turkey bacon and “fatty” pig is negligible—and depending on the slice, turkey might sometimes tip the scales a touch more. Additionally, while turkey is indeed a leaner meat, turkey bacon isn’t made from 100 percent bird: One look at the ingredients list will show a long line of suspicious additives and extras that can’t possibly add anything of nutritional value. And finally, the sodium content of the turkey bacon is actually higher than what you’ll find in the kind that oinks—so if you’re worried about your blood pressure, opting for the original version is usually the smarter move. Zinczenko has a point – LOTS of turkey bacon brands out there are, in fact, still hiding pork. They’re also put together using TONS of chemicals because turkey does not have a CUT of bacon. Bacon comes from a very specific part of the pig. Turkey bacon is just put together pieces of turkey, sometimes held together by foreign substances, and maybe even dyed a certain color to make it appear to be more like bacon.What Zinczenko fails to address, though, is that people don’t choose turkey bacon over pork bacon just for “leaner bacon.” LOTS of us choose the turkey option because WE DONT EAT PORK. So… that being said, the rare occasion that I eat turkey bacon – literally, once a year – I buy the ONE brand I’ve found that has NO artificial chemicals or strange substances. What? Are you shocked that turkey bacon might have pork in it? Well, why wouldn’t it? If a manufacturer knows that you’re shooting for as authentic a bacon-flavor as possible, even though you’re buying a product that doesn’t really even have a cut of bacon in it… you think they’d pass up the opportunity to put pork in it? Knowing the pork would provide the flavor you’re after? And speaking of flavor… if you’re buying the wrong brand of turkey bacon? Rest assured it is as unclean as any pork bacon you might find. Foreign substances all over the place are included just to accommodate that “bacon-y goodness” you might find in pork. Turkey bacon also benefits from a bit of a “health halo” that implies “since this is poultry, not pork, it must be better for you.” Trust me – fried chicken is never “better for you” than grilled steak. The details always matter. Always. Turkey bacon is a meat product usually prepared from smoked, chopped and reformed turkey and commonly marketed as a low-fat alternative to traditional pork bacon. While turkey bacon can be used in place of regular bacon in some dishes, it cannot be used in recipes that require the higher fat content of pork bacon. Emphasis on the “reformed.” That means “formed into a shape similar to what you’re used to expecting from pork bacon.” Let’s be real – turkey bacon requires a lot of work. If you’re asking me, personally? I don’t bother. The last time I had turkey bacon would be sometime in May… it’s something I could leave or take. It’s pricey, for starters, and y’all know I’m cheap. But for anyone who wants to leave the swine behind… you can do turkey bacon in a decent fashion. I hit up the grocery store and took a couple of snapshots of the last brand I had. That’s what it looks like on the front. On the back? “Turkey thighs, water, sea salt, raw sugar, celery powder, paprika, onion powder, spice.” 30 calories a slice, 180mg of salt per slice, .5g of fat. Know what you’re getting yourselves into – if you want turkey bacon, go with as minimalized an ingredient list as possible. This is a great start. I read that article and certainly did smile–as a pork bacon lover. lol i actually eat the Oscar Meyer Center Cut brand they suggested, and good Lord is it expensive! but better than the fattier brands. *wall slide* Not my turkey bacon! Dang E. FP strikes again! 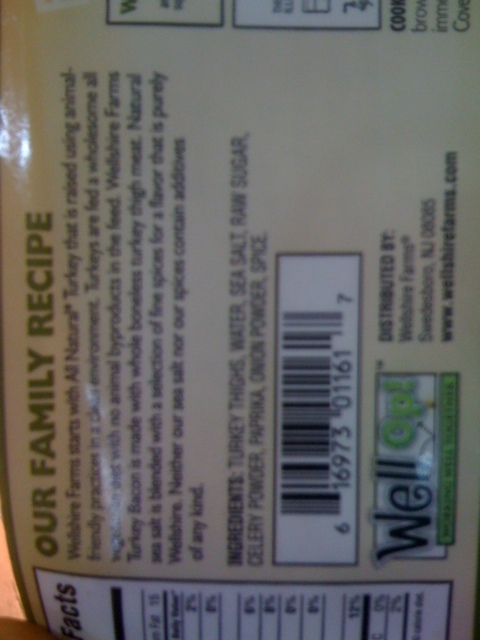 I never thought to look at the ingredients in turkey bacon. I need to start paying more attention, because obviously I’m not doing as well as I thought in the “clean eating” department. My “do better” is on level 10!! I actually buy this brand from whole foods. I do “cheap out” sometimes and buy the other brands. Yea, won’t be doing that anymore. Why do I feel like when this is all said and done I will be vegan? LOL! The worst brand of turkey bacon is…well, let’s just say the name rhymes with “Fluttermall”–it’s extremely thin and it puffs up like fried bologna when it’s cooked! I have a love/hate relationship with those “Eat This Not That” books that Zinczenko makes: In the wrong way, they give anyone an excuse to eat FF as long as it is “lower in calories” than their original choice without looking at other numbers (sugar, salt, fat, etc) but in the right way, they can at least help people watching calories when they are in a tight spot. I am quite the label reader, especially now, and I believe Trader Joe’s uncured turkey bacon has about the same or less ingredients as the turkey bacon above. I believe the caloric intake and amount of fat is also the same. with little or no fat and no additives and chemicals. I paid $2.99 for a pack of 8 slices. since i only eat most mornings for breaksfast(oatmeal with nuts, raisins, and almond milk) at least one day out of the week I will eat my grits, range free eggs, and my turkey bacon. so you are right my girl. I took another look at my turkey bacon and while it doesn’t contain pork, there are a few extra chemicals that I would rather not put in my body any longer. P.S. I have been wanting to ask you about turkey bacon for awhile, but I didn’t know if you would react the same way you do to pork bacon. I didn’t want to cause you any additional stress ;-). 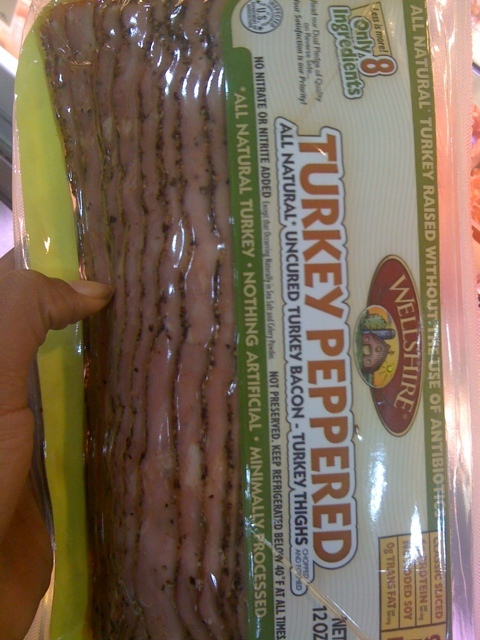 Soo now u have me wondering ab my beloved Dutch Market turkey bacon….smh. is it just as bad as the super processed pork dipped turkey from thegrocery stores? I have never been a real fan of Turkey Bacon and I don’t eat pork so I was paying like $4 for beef bacon. Then one day I was reading packages and saw that a lot of Turkey Bacon is DIPPED IN PORK FAT!! What in the world? The only major brand that is not and says it on the back is Oscar Mayer Turkey Bacon. It’s as expensive as beef bacon but I do like the taste of it. I’ve been eating “turkey bacon” for years. Now, I have to make sure there’s no pork in it. Thanks for the info . . .
Shamefully (sort of) I got a great deal on OM turkey bacon last week, $1.50/pk. It was on sale for $2.50 & had a $1 off coupon on it. Pork bacon was $3+…..